Update: Check out Twitter 140 for a helpful further explanation. Follow me (I’ll follow you back). Social Media University, Global (SMUG) is built on the distance-learning paradigm. And unlike traditional universities with on-line programs, we don’t have a requirement that some of the credits be taken on campus in a group setting. Don’t get me wrong, we’d love to have you visit… one at a time. While you’re here in Austin, Minn. you can also see the world-famous SPAM museum. People have been known to come from as far as Hawaii and Guam to visit the birthplace of the canned meat that saved Western civilization during WW II. So if they’ll travel that far for SPAM, maybe you’d want to do it for SMUG, right? If not, and if you’d like to organize a group to have SMUG’s Extension Service bring an intensive session of classes to your community or company, let’s talk. Face-to-face dialogue is still the most effective way to learn. We can do a Blogging Bootcamp. A Facebook Forum. A Wiki Workshop. A Twitter Tutorial. A Podcasting Program. Or we could tie it all together into a Social Media Summit. Then you can continue your SMUG education through our on-line courses. 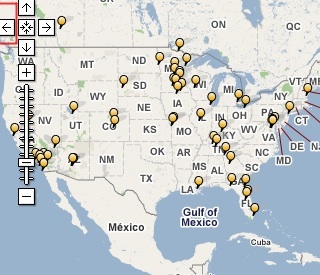 If you see a pin on the map for your city, I’ve been there before. Not for SMUG classes, but I know how to get there. I’d be glad to visit again. If you don’t see a pin for your city (or if your continent isn’t even shown! ), it would be a new adventure for me. That would be fun, too. All blog posts should have a graphic or video of some kind to make them more interesting. Having the map accomplished that for this post. If you’re interested in SMUG Extension, see the “Contact the Chancellor” box on this page. Day Two of the ALI Conference is about to start. Today’s agenda includes case studies from Cisco Systems, Rolls Royce, Best Buy, IBM and American Express. Chris Heuer from the Social Media Club and The Conversation Group will be leading a group exercise. And our conference chairperson, Michael Rudnick, will tie it all together. I’ll be blogging again as an embedded report from the front lines. Look for dispatches throughout the day here and on Twitter. Sallie Boorman from APCO Worldwide mentioned in this morning’s session that her company has created a SuperTuesday account in Twitter to follow today’s electoral festivities. It’s also connected to their Virtual Vantage Points blog. Since I’m missing the Minnesota precinct caucuses, I’m going to check it out. You should too. Note that a few days ago that 3GB figure in the lower left was only 50 MB. I formerly used Flickr as a storage space for my photos and other graphics (since it offered 100 MB a month vs. 50 MB a year with WordPress.com) and just pulled the graphics from Flickr into my blog posts, but now it seems I should be able to upload graphics indiscriminately without even coming close to exceeding my WordPress limits. Especially if I’m uploading mostly 72 dpi screen captures. As Erick Schonfeld says, this is a huge advance that puts significant pressure on competing platforms. WordPress.com has had the advantage of Akismet protection against comment spam (which has saved me over 34,000 spam comments.) By offering triple the free storage of Blogger, WordPress.com takes another big leap. When I started this blog, I made it my goal to never spend a penny on any of the services. My purpose was more than miserliness; I wanted to encourage others (particularly those in the PR field) that they can have blogs without spending any money and without support from their IT department. As I say in my “It’s All Free” section, if you see something on my blog that you like, you can rest assured that it was completely free. Why is free such a big deal? Because it helps to drive home the ridiculousness of spending several hundred to a few thousand dollars to attend a communications conference in which you learn about social media if you fail to take the next step and actually get hands-on experience. And it’s why I developed my 12-step Social Media Program. You really should check out Facebook, too. It’s also free. Friend me if you’d like to stay in touch and learn more about social media. If your work involves any communications, or marketing, or sales, or management responsibilities you owe it to yourself to begin to understand social media. And if you paid anything for college, or attend any career enrichment seminars for which you or your company pay admission fees, you’re seriously missing out on a great educational value if you don’t take advantage of the free hands-on education you can get through WordPress.com, Facebook, Twitter (you can follow me here), Flickr, YouTube and related services.